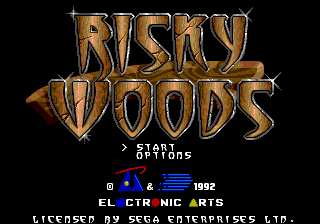 Risky Woods, known as Jashin Draxos (邪神ドラクソス) in Japan, is a 1992 side-scrolling platformer developed by Electronic Arts, Dinamic Software, and Zeus Software and published by Electronic Arts for various home computers and the Sega Mega Drive, with some regions seeing an early 1993 release likely due to the late completion of the game. It is Dinamic's only Mega Drive game and the last game they would develop before going bankrupt. The Sega Mega Drive has some deliberate changes that make it different from other releases. Rohan is the lone controllable character, a traveler who must free the monks of the Lost Lands who have been turned to stone. Before each level is a side-scrolling map screen; use , , or to play a level. fires a weapon at enemies, bags, and treasure chests. jumps. is for using keys. Coins left behind by enemies, and other items (such as treasure chest contents) must be picked up by pressing to crouch. Statues block the path through the (fairly linear) stages, the can only be removed by collecting circle shaped keys. Each statue then plays a random sequence of up, down, left and right prompts. The player must memorize these and replay them in the correct order to destroy the statue. The default weapon is a dagger, though other weapons may be found throughout each level. There is a time limit to complete each level. Rohan can obtain a silver and later a gold armour by accumulating enough points. The silver armor lowers the damage received from attacks, while the gold armor makes Rohan almost invincble, as Rohan drops coins instead of losing health. Rohan has a different outfit, both in-game and in the ending. The armor system is completely new. The puzzles required to destroy the statues were also added for the Mega Drive version. Main article: Risky Woods/Magazine articles.